This year Canada will celebrate its 150th anniversary — what a great milestone! She has come a long way and there is so much that we have to celebrate about this great county. As part of the birthday celebrations, this year Parks Canada is providing their Discovery Pass free for all. What a great present! I ordered mine as soon as I heard about it. You can go to the Parks Canada website and order it . You can visit any of the many of the National Parks, National Marine Conservation Areas and National Historic Sites across Canada for free, any number of times for the entire year! One pass is valid for a group of people travelling in the same vehicle. So I thought this is the perfect year to try and visit some of the national parks on my bucket list! If we had the time and money, we would have visited them long ago since we are a family that love to visit national parks. This national park has been on my bucket list ever since I heard of it. I never get tired of looking at pictures of Lake Louise and the snow covered mountains. It’s the first national park of Canada! It’s a beautiful park situated about an hour and half’s drive from Calgary. There are many campgrounds and lodges inside the park. Why do I want to visit this amazing park? Mainly due to the sheer beauty of it — snow capped mountains, pristine lakes, pine forests and glaciers all come together to create a picturesque scenery that will stay in your memory forever. There are also plenty of activities to do; like hiking, canoeing, and horseback riding to name a few. This park is situated in Alberta, north of Banff and west of Edmonton. If I can visit Banff, I will certainly make it a point to visit this beautiful park close by. It is the largest national park in the Canadian rockies. Why do I want to visit this park? I want to take a drive through the world famous Icefields Parkway, where i will see ancient glaciers, pristine lakes and waterfalls, and spot bears, elks and sheep. It is another park with beautiful scenery and plenty of things to do. This is another beautiful park that I want to try and visit; located in the northern most tip of Cape Breton Island in Nova Scotia. To me it’s the Scotland of Canada. One of the most scenic routes in North America, the Cabot trail runs through the national park. Cliffs, mountains and highlands and quaint little fishing villages make it a scenic drive worth doing. There is also no shortage of activities to do while you are there; breathtaking hikes, freshwater and ocean swimming, fishing, cycling, kayaking and more. I would love to camp their in their new oTENTik: part tent, part cabin; as we are not very fond of rouging it out in the open. I came this close to visiting this national park last year but when we reached the park gates around late morning, the parking lot was full and we couldn’t enter. So if you are planning on visiting this park, I would strongly advise you to go on a weekday and shoulder seasons or plan on staying the night at Tobermory a beautiful fishing village near by and go early the next morning. Why do I want to visit this park so badly? Again, for the beautiful scenery that you cannot see else where — cliffs, turquoise waters, abundant wildlife, beautiful forests and the famous grotto — I want to go inside and explore this beautiful sea cave! Located in New Brunswick, along the Atlantic coast of Canada, Fundy National Park is another great park that I would love to visit. Where else will I get the chance to walk the sea bed at low tide and paddle in a kayak at the very same place at high tide — all in the same day! While I am there I would like to stay in Park Canada’s new oTENTik tents (like the ones they have at Cape Breton) and hike the rugged trails and see some of the waterfalls. While this park may not be as big as the others, I can’t afford not to visit this as it is the closest one to where I live. It’s only three and half hours drive from Toronto — a perfect park for a day trip! Point Pelee is the southern most point in Canada! I would love to see the migration of the birds and paddle through the wetlands and have a picnic on the sandy beaches. While these are my favourite national parks, there’s plenty more that I would love to visit. This year is a good time to start visiting the national parks — at the very least the ones that are close to you as they are completely free 🙂 Now who doesn’t like free stuff!! Shrimp has always been a favourite dish in our household. Of all the different ways that shrimp can be made my kids prefer this recipe the most. So I thought I would share this recipe with you. It can be eaten with with any kind of rice or flat bread. I hope you enjoy it as much as we do. 1/2 red or white onion chopped. Clean and wash the shrimp. Add salt, turmeric, chilli powder and mix well and set aside. Heat the oil in a medium pan and when its heated add the chopped onions, garlic and curry leaves. Cook until the onions begin to brown. Now add the tomatoes and cook for a few minutes. Add the shrimp mixture and cook till the shrimp looks cooked. Then, add the coconut milk and cook for a few more minutes on low heat. Take off the stove and serve with white rice, roti or naan . Is engineering on your childs radar? Over the years Engineering has become one of the most sought after program to study and the most expensive undergraduate program to pursue (ranging from 10k-15k in tuition alone in Ontario.) It has also become very competitive to get into one. To get into a good Engineering school like U of T, Waterloo, Queen’s etc, you need a competitive average of 90 or higher,.any other school at least an 80 plus.So how does one get into this program? As a mother of two kids who have chosen to become engineers, my son just finished his masters and my daughter started University this year to pursue a degree in Industrial Engineering ,I thought I will share what I have learnt about preparing and getting into an engineering program. Getting good grades in core math and science subjects is the number one priority.Help your child do their very best in school by providing help getting involved in their work and offering a good place to study. If your school offers and your child is upto the challenge it can be beneficial to do AP or IB courses as it prepares them for rigorous work and in some cases can be counted as a university credit.If your school doesn’t offer these don’t worry my son got into the best engineering program in the country by getting good grades in the normal university courses the school offered. Choose courses that help with an engineering program.Apart from the pre requisite math and science courses courses like computer science, data management are important for an engineering degree. If its possible do one or two grade 12 courses in Grade 11 so by the time you start grade 12 you already have one or two credits completed. This way you have some spare time to concentrate on the rest of the subjects. Doing the various math and science competitions right throughout high school. These contests are hard to score but just saying that you did them look good on a university application and lets the university know you are serious about STEM. You don’t have to report the scores to any university so it doesn’t matter if you didn’t do that well. Doing the research! As a parent its our responsibility to research about the programs and university that is right for our child.This is why going to a university fair is important. If you’re thinking of applying soon, the Ontario University Fair will be held from Sept 23rd-25th at the Metro Toronto Convention Centre. There will be representatives from each school and respective program there to answer your questions. It’s a good idea to go with your child, even if you aren’t applying to university this year.You can also find out about the ranking of each university in the macleans guide. I might be biased but to me the best university for engineering is University of Toronto! They have one of the best engineering programs in the world! Finally applying to the chosen programs! Now that you have done the research, and choosen the programs its time to do the application. Certain schools such as Waterloo and UofT require the applicant to write short responses on why they are interested in engineering. UofT also has a mandatory online application called the personal profile. Here students are asked questions and are expected to answer them on video under 2-3 minutes. Questions include simple concepts to see how the student problem solves, as well as questions regarding their interest and experience in STEM. We made sure that we applied to at least five programs in various universities. One top school, a few safety schools that we have a good chance of getting into and one back up school just in case. Take time to prepare a good application and apply through OUAC. Researching about universities is something I love doing and quite good at. So if you need any help with anything I will be more than happy to assist you, leave a comment below. I hope you found this post helpful and I wish your kids every success in their path to becoming an engineer! National Parks to visit with family. This year, The National Park Service of the United States is celebrating their 100th anniversary and they want to celebrate by having everyone be a part of it through embracing the opportunities to explore, learn, be inspired or have fun in one of their 407 national parks. As some one who loves visiting national parks I thought I would do my share in writing this post about the national parks I have visited over the years. It’s the very first national park that I visited in the United States and the only one I visited twice. If you have been there you will understand why its number one,If not it should be on everyone’s bucket list. No words can describe the majesty and beauty of this great park. Located an hours drive from Flagstaff, Arizona, the South Rim of the Grand Canyon is the most visited side of the park. The South Rim is open year round, while the North Rim is open from May – October. We started our journey in the Grand Canyon from the Visitor Center in the South Rim and took the free shuttle bus, to see the various look out points. You can get on and off the bus whenever you want. The Hermits Road route is the one with the most scenic look out points. You can take a hike to the bottom of the canyon or opt for a mule ride. If you decide to go down make sure you take plenty of water bottles with you. If you hike all the way down you can take a rafting trip in the Colorado river and see the canyon from the bottom-up. You can also camp at the campground or book lodging inside the park. If you decide to do this, make sure you do it well in advance. We stayed the entire day at the Grand Canyon and watched the sunset and then drove to a motel in Flagstaff for the night. The oldest national park in the United States, Yellowstone, is another great park I was lucky enough to visit. Located in Wyoming, it spans three states – Wyoming, Montana and Idaho. In this park you can see hot springs, mudpots, geysers, water falls, rivers, lakes canyons, forests and plenty of wild life all in one day. The Old Faithful geyser is the one of the most famous landmark in the park. It sprouts every ninety minutes and goes up to 100 meters. I remember sitting at the benches and waiting for it to erupt. The best way to see this park is to drive in your vehicle and stop at points and hike to see the hot springs and water falls. Or you can choose to take a guided tour. There is food and lodging inside the park but it can be very pricey and needs to be booked in advance. We decided to stay the night at the motels that are located just outside the park. The Great Smokey Mountains National Park is the most visited national park in the United States. It straddles the border between Tennessee and North Carolina and is part of the Appalachian mountain range. Its a great park to take the kids. You can see plenty of wild life, old pioneer buildings and there are plenty of scenic drives. The best way to see this park is to drive in your vehicle through the various loop roads and stop at the look out points or take a small hike to see the waterfalls or the river. Clingmans Dome is the highest point in Tennessee. You can take the seven mile road from the Visitor Center to the parking area of the Clingmans Dome and from there take a short half mile hike to the observation deck, where you can experience the 360 degree panoramic view of the Smokey Mountains and the surrounding area. Even if you aren’t up for the hike, you can still see beautiful views of the mountains from the various lookout points along this road. Cades Cove Road: This 11 mile loop road is a must see during your visit to the park. It’s a slow paced drive (as its a one way road) and can take about 2-3 hours. There are old churches, school houses, log cabins and a working water mills along the way. You can stop and explore the interiors of these buildings. Along this route you will also see deer, turkeys, black bears, coyotes and meadows filled with wild flowers. During our trip, we saw a black bear crossing the street and a baby bear sitting on the branches of a tree. Our kids thoroughly enjoyed this drive. Little River Road: This 18 mile road winds along the Little River. Along the way you will see waterfalls, scenic overlooks, picnic areas and trailheads You can take short hikes to see the many waterfalls along this route. 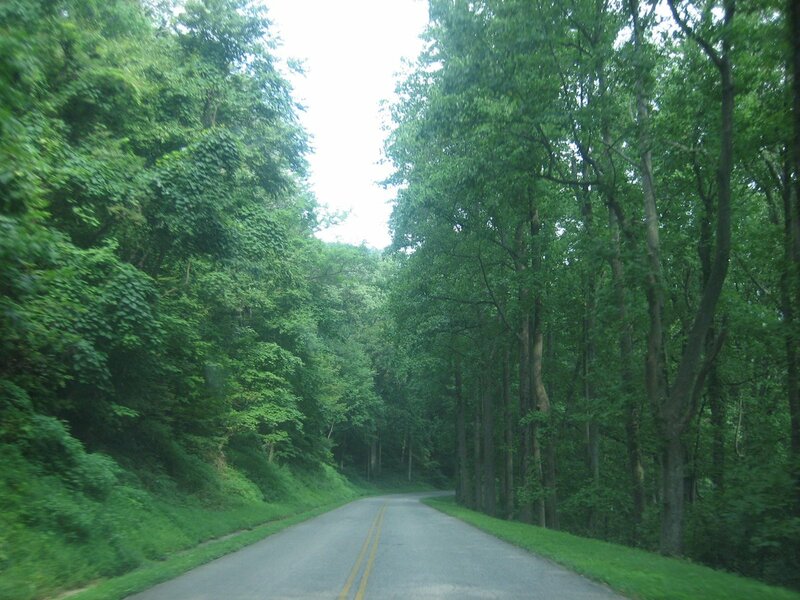 The Roaring Forks Motor Nature Trail: This six mile long loop road drives is a picturesque scenic drive through the mountains. Like the other routes, along this route you can take short hikes to see beautiful waterfalls . There are also riding stables and campgrounds inside the park.. There are also many hotels and motels in the surrounding towns in Tennessee and North Carolina. And once you get tired of all the nature activities, you can go the nearby town of Pigeon Ford which is similar to our Cliffton Hill and enjoy the fun there. I highly recommend you take your kids to this national park, as it will instill a love of nature in them – they will see wild life, beautiful natural surroundings, scenic views and get a glimpse of how the first settlers lived on this land. You will enjoy all this for free, as there is no entrance fee to the park! Situated an hour and half’s drive north of Denver, the Rocky Mountain National Park is another national park with a scenic drive. To get to the park, we took the scenic route from Boulder, Colorado (via routes 119,72 and7). It featured a breathtaking view of snow covered mountain tops, and green valleys below. This route takes you to Estes Park – the eastern getaway to the park. Once in the park, the best way to see this park is to drive through the Trail Ridge Road – a 48 mile road that ends at the other end of the park at Grand Lake. This is the highest paved road in the country, which reaches 12,000 feet above crossing the continental divide — nearly one third of the park sits above the tree line. Here only alpine tundra grows. Keep in mind as you go higher the temperatures drop at least 20 degrees and it can cause headache, shortness of breath and rapid heart beat. Prepare by making sure you have a jacket as it gets very cold and windy at the top. Apart from the majestic views you can see plenty of wild life including elk, deer, moose, big horn sheep and a variety of birds. If you are into hiking, there are so many hiking trails from simple lake side ones to more difficult mountain climbs. The hike from the Bear lake to Emerald Lake, is the most beautiful trail in my opinion, where you will pass through three lakes and many waterfalls. It provides many photo ops. These lakes can only be seen by hiking however. Remember to take plenty of water and maybe supplies for a picnic, to have at the Emerald Lake. There are also many stables which offer horse back riding tours. In this digital age, this is a great park to take the kids to appreciate and experience nature at its best! Glacier National Park is another beautiful park to visit which is shared by both the USA and Canada. The American side is in Montana and the park is in Alberta on the Canadian side. Apart from the many glaciers you can see there is beautiful scenery all round you. Pristine lakes, vast meadows of wild flowers, snow capped mountains, cascading waterfalls and wild life. Whether you are there for a long stay or just driving by, it’s a great park to view nature at its best. There are many hikes that will lead you to breath taking views and beautiful alpine lakes. My kids enjoyed playing in the snow in the summertime at the base of the mountains. You can also take horse back riding tours . The main attractions of the park is the 50 mile, Going to the Sun road – one of the most beautiful drives in the country. This scenic road passes through many look out points include the Garden Wall, Logan Pass, Jackson Glacier Overlook and St Marys Lake. It also passes through tunnels, camp grounds and hiking trails. Passing though this road, we saw a big horned sheep and a grizzly bear. You can either take a free shuttle from the visitor center or drive in your own car. There are many lodges and camp grounds and restaurants within the park. When visiting this park, remember the water can be very forceful and cold. Rocks can be slippery. And of course, always stay on the trails and keep an eye on the little ones so that they don’t wonder around. Situated in the western side of South Dakota, Badlands National Park is probably the only national park where you are most likely to find ancient dinosaur bones. This park is one of the most treasured archaeological sites in the country and probably holds one of the largest fossil beds in the world. It’s a beautiful scenic park with rugged rock formations and vast meadows, kind of like a mini grand canyon but where you can actually climb and walk on the rocks. A stop a the visitor center is a must – here there is a museum with interactive exhibits. You can see a movie about the history of the park and learn more about the fossils that are found. There’s also a fossil lab where children can do hands on activities and see scientists at work. The next thing to do is take the 30 mile long, Badlands Loop State Scenic Byway (Highway 240) which goes through the Bad Lands. This is a very breathtaking scenic drive where you will see various unique rock formations. At times it feels like you’re driving through a huge sand castle. There are nearly 30 scenic overlooks and many hiking trails. You can stop at many places along the route and climb the rocks. We enjoyed walking and climbing up and down the rock formation.The temperature in the area can get very hot, so wear comfortable clothes, hats, climbing shoes and bring plenty of water. There are many animals in the park that can be seen like prairie dogs,mule deer, antelopes,mountain goats, buffalo and various birds. When we went, we just drove through the park once but if you are staying in that area its a good idea to visit the park at various times of the day; sunset, sunrise and mid day to see the colour changes.The park pass is valid for seven days so you can do this easily. This is a great park to visit as its only an hour and a half drive from Washington D.C. The Skyline Drive, which is the main attraction of this park goes through the park from one end to the other. The Skyline Drive (which includes the Blue Ridge Parkway) is a 105 mile scenic drive along the crest of the Blue Ridge Mountains with over 75 look out points, which offer breathtaking views of the mountains and the valley below. It’s a winding two way road with lots of twists and turns and the speed limit is 35, so you can enjoy the ride at a slow pace and pull over at the many look out points. Driving through this road, I felt as if I was driving in the sky! As you drive along this road, you may also be able to see some animals crossing. There are also many trails to hike and you can also rent horses to go on wilderness trails or go fishing in the many streams. There are five camp grounds if you want to camp as well. We did this drive during the summer but it’s also a good idea to go in the fall to see the fall colours. These are some of the parks that I have visited of the many in the United States. I hope I have encouraged you to go out and explore the national parks and reconnect with nature. Coming from South Asia in my early twenties, the very first thing I wanted to do when I came to America was go to Disneyland. A couple of months after arriving, I mentioned to my friend that we were planning on flying from Las Cruces (we were living in New Mexico at the time) to go to Disneyland. She was slightly surprised and asked me why I would fly there when I can go on a road trip instead and see everything on the way. This concept was new to me; the longest drive I had gone in my country was only 4 hours long! Even though I couldn’t imagine doing this, some how she managed to persuade us to join them and go on a road trip to LA. Needless to say, since then we have been hooked. We try to go on road trips whenever we can and over the years we have been to more than 35 states and 3 provinces and clocked more than 25 thousand miles . So I thought I would share some of the things I have learnt road tripping. Plan ahead as to where you will go, which route you will take, where to stay, what to see and do, and how much to spend. It’s important to plan but also allow for some flexibility. On a road trip things can happen which are beyond your control; a flat tire, delays from traffic or you just might want to spend more time somewhere than you originally planned. Have your vehicle ready for the long road trip. The most important thing for a road trip is to have a vehicle that is reliable. If your vehicle is an older model, I suggest renting one. When we started out doing road trips while my husband was still in school, we had a battered old vehicle — so whenever we went on a road trip, we would rent a car. This way you don’t have to worry about the extra miles you put in or if the car will break down halfway through your trip. When renting we always went with a company that offered unlimited mileage. Usually Hertz or Discount Car Rental worked best for us. Have all the necessary papers and documents. Make sure you have insurance and rental papers, passports (if you are crossing the border), and some cash with you on your trip. Despite all the plastics that we can use, there will be plenty of instances where you will need cash and finding an ATM machine on the road can be difficult. Have an emergency roadside assistance membership. No matter how new your car is or how experienced you are, you need an AAA/CAA membership if you are planning on going on a road trip. I remember once, in the deserts of Utah, we left our keys in the car and accidentally locked it. There was no large city nearby but AAA came to our rescue. They sent someone from a nearby town to help us and we were able to get back on the road in a couple of hours. Also, with an AAA/CAA membership you can get discounts for car rentals, attractions and lodging, and you can be sure that the hotels and motels are of good quality. We have done this many times and saved hundreds of dollars. These organizations also provide you with maps, personalized trip plans (that can be prepared beforehand), and tour books of states and provinces. It’s also a good idea to have an emergency roadside kit with a flashlight, help sign, blankets and first aid. God forbid nothing bad happens but in case something comes up, its better to be prepared. Pack your Gadgets – but don’t forget your maps. Pack the GPS, cell phones, the chargers, laptop, cameras and all the tech you need. Once in Pittsburgh, we missed our exit and got lost in the city. In a big unfamiliar city, its not that easy to navigate unless you have a GPS. With the help of the GPS, we were able to get back on to the highway without any trouble. Even with all the tech we still need this. You can see the whole area on a physical map and in case the tech lets you down, you have something to fall back on. Make your reservations before you go. Make hotel reservations in advance but also make sure you can cancel. in case you get delayed on the road. The last thing you want to do after driving for 8 or 9 hours is to go hunting for a place to stay, especially in the summer and near popular destination it can be hard to find a place to stay. This has happened to us a few times. In case you decide not to book before you go, its best to pick up a copy of the Hotelcoupons booklet which can be found in most rest areas and welcome centres – it has walk in special coupons on many hotels/motels and has a complete list of locations, with clear directions as to how to get there.we have used these coupons and got really good deals on hotels which are usually beyond our price range. I feel its very important to drink plenty of water while on a journey. My husband also takes Ensure energy shakes to keep him energized during the trips as he is the only driver. Make sure to have plenty of snacks easily accessible so that you can reach them while driving. Have a mix of healthy and junky snacks, after all you are on vacation and can afford to indulge. Choosing a route – Scenic or Interstate? This can vary from person to person. If you take the Interstate or TransCanada highway you can be sure that there will be plenty of rest areas, gas, food and lodging, exits on the way and plenty of other cars on the road — you don’t want to be the only person seen driving on a lonely highway. Whereas if you take smaller roads, you can go for hours without finding any gas stations or rest areas. Once, we decided to take a short cut from Toronto to Washington DC instead of taking the interstate. We ended up driving for a long time before we finally found a place with a bathroom. It can also be very tiring and boring to have to drive with a reduced speed on these roads. But on the other hand if you want to enjoy the beauty of the country, you really have to take the back roads or scenic ones. Whenever there was a scenic route on our way, we took those routes (most CAA or AAA maps indicate the scenic routes). Once, when travelling in North Carolina, we took the Blue Ridge Parkway which cuts through the Appalachian Mountains and provided some breathtaking views. We also took several of the scenic routes in Colorado which showcased the beauty of the Rocky Mountains. Take a different route each way. We always took one route to go and a different route to get back.That way we were able to see more places and pass through many cities and landscapes. After all, in a road trip it is the journey not the destination that matters. Avoid driving on major holidays. Avoid choosing Memorial Day, Independence Day, Labour Day or any major holiday for travelling. During a road trip you don’t want to be stuck in traffic.If you are passing through a major city try not to go during rush hours.it can take you a long time to cross the city. It’s also not a good idea to travel when there are special events taking place. When we went to Calgary, we went during the stampede and traveled to South Dakota during the annual motorcycle rally.It was hard to find a place to stay and everything was double the usual price and the whole place was so crowded. Don’t drive for more than 8- 10 hours a day, we usually stop before sunset. It can be dangerous driving in the dark when you are tired. When you plan to drive for only about 8 hours you have enough time to stop if you see something interesting on the way and still reach your destination for the night. Once when coming from Boston to Toronto we happen to pass through the white mountains and decided to check it out. Not only did we end up staying there for half a day but vowed to come back on another day. Take your favourite music with you. Have a CD or Ipod with everyones favourite songs that you can play over and over again on your road trip, this way later on when you hear these songs, it can take you back to your road trip. Finally, go with an open mind, don’t sweat the small stuff and make memories. It’s all about having fun with the people you love and seeing this beautiful continent. I love the USA and Canada for all its natural beauty.